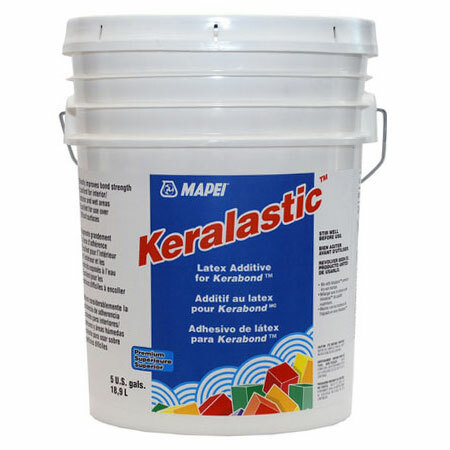 Keralastic™, a second-generation “flexible” acrylic latex additive, is used to enhance the performance of Kerabond™, which is a premium-grade dry-set mortar. This system has exceptional bond strength, flexural strength, elongation and freeze/thaw durability. • Install only at temperatures between 40°F and 95°F (4°C and 35°C). • Do not use for moisture-sensitive stone (green marble, some limestone and granite), agglomerate tiles or resin-backed tiles. Instead, use suitable epoxy or urethane adhesives (see respective Technical Data Sheet for more information). • Some glass tile backings may not be suitable for use with Kerabond/Keralastic. Consult the recommendations of the TCNA and the glass tile manufacturer. • For translucent or transparent glass tile, use white Granirapid ® or Adesilex™ P10. • Use a white mortar when installing light-colored stones and translucent marble. • Do not use over dimensionally unstable substrates such as hardwood flooring, oriented strand board (OSB), substrates containing asbestos, or metal. See “Suitable Substrates” section below. * Open time and pot life vary based on jobsite conditions.